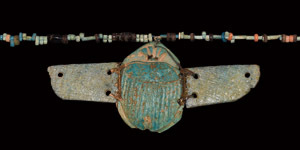 A restrung necklace of mainly blue glazed composition annular and tubular beads, interspersed with some black annular and tubular-shaped beads; the pendant a large blue glazed scarab plaque with detailed carapace, striated wing plaque to each side; old auction sticker from Skinner Auctioneers to the reverse. 29.6 grams, 31cm (12 1/4"). Fine condition. From an Illinois, USA, private collection; formerly in a Boston, USA, private collection; acquired in the early 1940s; accompanied by copies of old labels, one dated 1940-1944. Please login or register here.